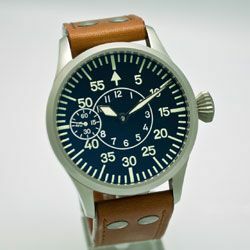 I’m one of the Pilots who has flown with this watch in Afghanistan. Loved it. The display is the right size for great visibility in the Cockpit without being obtrusive on the wrist. Hit the face with a flashlight beam for 10-15 seconds and it illuminates brilliantly throughout night missions without being distracting. The minute hand on the outside is what I have come to love from an operational standpoint as well as asthetically (sp?). About 90% of the flying was based on the Minute and this watch allowed an easy crosscheck to what had been planned and what the current actual was. For those missions that required landing times to the second I would use the Helicopters onboard GPS. It held up very well. Did not lose any appreciatable time. Only point would be to make sure you tighten the wrist screws on the band with maybe a little loctite. Lost two of them but Al was kind enough to replace with a couple spares he had. Last, it is a great looking watch and have more comments about it than any other I’ve owned and one must love when someone picks up on the watch amongst the sea of Breitlings and Tissots at an Air Show. As a Pilot in the RCAF it is nice to fly with a Canadian built watch. So, you’re not just getting a good looking watch – you’re getting one that’s been flight-tested and mission approved! Next articleWould A Woodchuck Chuck It?